Mystery Gallery: Do you recognize this photo? Three women in an unidentified retail store. The woman on the left appears to work at the store and is showing an item to the two customers. From the Kerr Studio Collection. Who are these women? Where was this taken? Send information with photo number 39 to kfrancis-love@mosthistory.org. 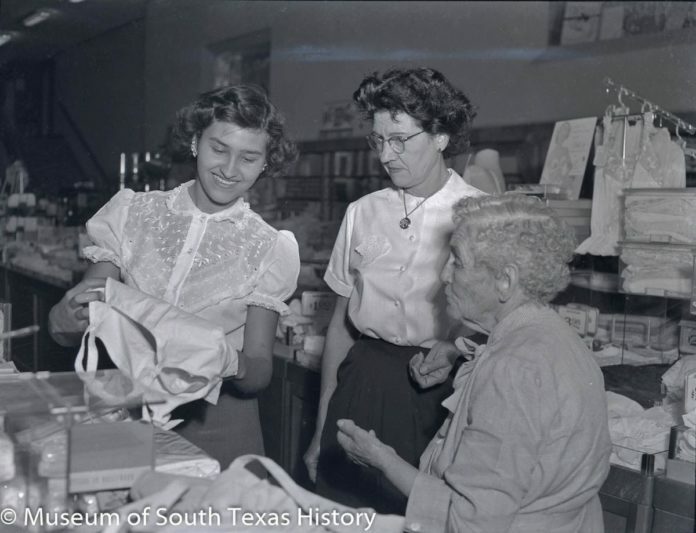 The Monitor will publish one photo from the Museum of South Texas History’s Mystery Gallery every Tuesday, Thursday and Saturday until May 19. The images will include the limited information MOSTHistory has on the photo. If you or someone you know may have details about a photograph that is published in The Monitor, you can email museum archivist Kelly Francis-Love at KFrancis-Love @mosthistory.org.